Somethin Wonderful: Of course I've got the hump, I'm a poodle! Of course I've got the hump, I'm a poodle! She looks like she's got the hump. And who could blame her? 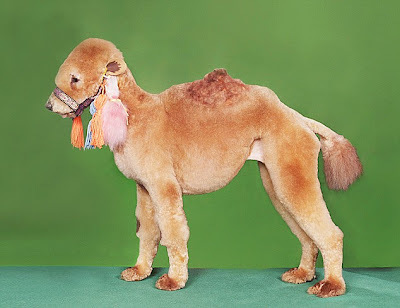 It took two hours of sitting still for Cindy the poodle to be transformed into this haughty camel. Owner Sandra Hartness, an expert dog groomer, insists her pet loves all the preening and prodding required. She and Cindy are regulars on the competitive grooming circuit in the U.S. Using harmless food dyes, chalks and some strategic clipping, she has changed her part-time poodle into a dragon, a chicken and even a Teenage Mutant Ninja Turtle. Sandra, owner of pet-grooming salon Sandy Paws, started competitive creative-grooming eight years ago. The 37-year-old said: 'I found out about creative grooming competitions through an article in a trade magazine called Groomer and Groomer. 'I spotted the amazing designs and immediately thought 'gosh!' I can do that and I know I can do it better. I started to think of pattern ideas and looked for inspiration all around me - from the television, books and even in my back garden. 'The competitions are a really big deal - you've got to do the styling in front of hundreds of people. 'The first couple of times I felt so sick and almost had to back out because of nerves. 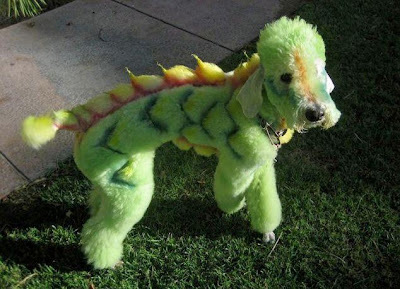 andra's first design was a green dragon, which earned her second prize in the 'First Creative Grooming' category at the Creative Grooming competition. She has since won seven first prizes for her designs, which have to be completed in just two-and-a-half hours. 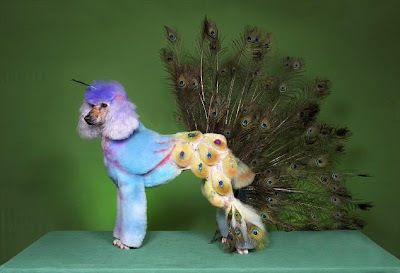 She said: 'Competition rules state that you can do some colouring and outline a pattern before the day - but you're not allowed to shave the dog for six weeks beforehand. 'You're under quite a lot of pressure but Cindy is so calm and collected when she's on the table - she's all business during the competition. 'She just stands there and does her job and when we're done she jumps off the table and wags her tail at everyone. The dogs don't have to stand up for the whole two and a half hours - Cindy is able to lie down and is allowed the occasional toilet break. Sandra, who lives in Yucca Valley, California, admits the reaction to competition and her extraordinary designs is not always positive. She has even received hate mail from people concerned with Cindy's welfare but Sandra insists her beloved dog is not in any danger. She said: 'Most people are positive about what I do but lately I've had a lot of negative comments from people saying that it's wrong and I'm hurting Cindy. 'I would never hurt my dog - she really is my best friend.Cindy never leaves my side. She's is like my shadow - We go everywhere together. She even comes to work with me every day. 'People don't seem to understand that the colours I use on Cindy are safe enough for a child to eat. t's food colouring and coloured chalk - both things that children put in their mouths. 'I know she won't come to any harm but I have her blood tested at least once a year to be on the safe side. 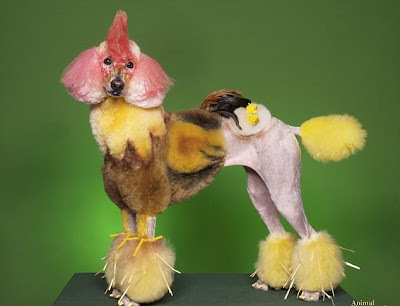 Sandra stressed that she would not do the competitions if Cindy didn't enjoy them and says the pampered poodle enjoys being in the limelight more than her owner. She said: 'Cindy loves it - I wouldn't do the contests if she didn't enjoy it but she knows it's her job.